Includes: 8 Days/7 Nights Stay in air-conditioned accommodations at the Cobalt Coast Beach Resort, choose from a Garden-View, Standard, or 1-Bedroom Standard Suite (Double Occupancy), all-inclusive meal plan which includes: full course buffet for breakfast, lunch & dinner. 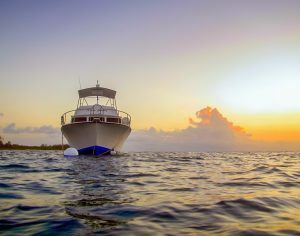 6 Days of 2 Tank morning boat dives with Reef Divers dive shop located on the property, unlimited shore diving, $100 resort credit, airport transfers, hotel taxes and service charges, Adventure Locators tour leader/instructor. Not Included: Round Trip Airfare, rental gear, dive staff/crew gratuity, certification/continuing education fees, soda & alcoholic beverages. The Smart Traveler Enrollment Program (STEP) is a free service to allow U.S. citizens and nationals traveling abroad to enroll their trip with the nearest U.S. Embassy or Consulate. Ocean view rooms with 1 king bed or 2 full beds. Lounge area with a small refrigerator and a full sleeper sofa. The bathroom has a door that opens into bedroom and hallway from the lounge. Some of these rooms have a lock-off door that when opened make them into a 2-bedroom suite with the garden room and room safe. Cobalt Beach Resort is located on the Northwest shore of Grand Cayman, Cobalt Coast is in a secluded tranquil neighborhood. 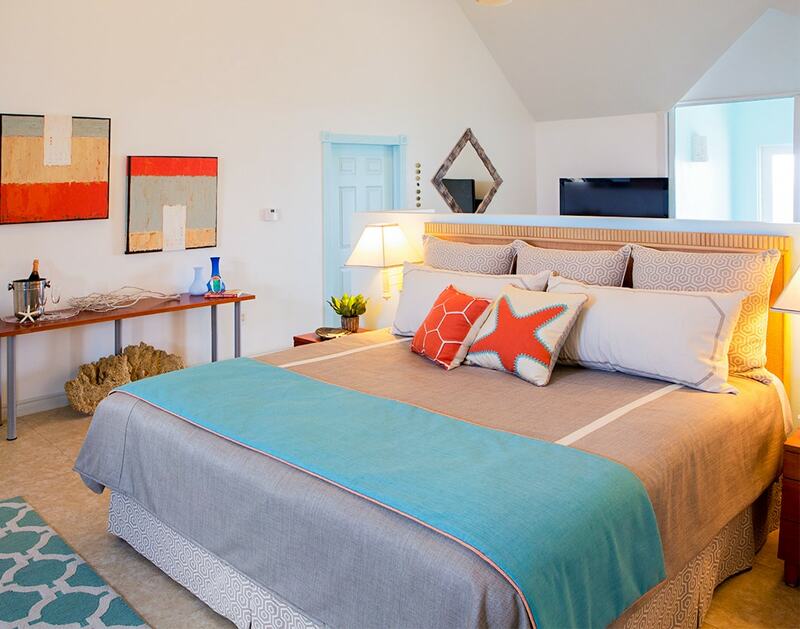 This is the only all-inclusive option on the island with a dive shop on site. 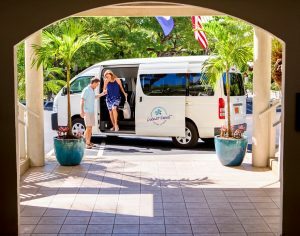 Escape the crowds to small, quiet Cobalt Coast Resort where you’ll have easy access to world-class diving and be close enough to the action and excitement of Seven Mile Beach and George Town to satisfy shoppers and partiers. Weather permitting, great shore diving is also available to guests on our house reef, and the fabulous North Wall is just a short swim away. Guests on meal plans will enjoy breakfast, lunch and dinner served in our open-air dining area overlooking the pool and Caribbean. We serve a combination of buffet and à la carte items from our menu. Breakfast consists of a variety of bread and pastries, fruit, cereal, yogurt, and a hot entrée. Lunches include selections of salad, hot entrée and sides, and light desserts. Complimentary beverages include coffee, tea, and fruit punch, with milk and fruit juices offered at breakfast. Dinner service includes a buffet soup and salad bar with a choice of 3 hot entrees prepared to order and accompanying sides. Dessert is also self-serve from our buffet. Coffee, tea, and fruit punch are complimentary. Reef Divers provides the personalized valet dive services that many of our guests don’t even know they want until they experience it. With 25 years of experience and being the only dive operator on all 3 Cayman Islands—no one knows or does it better than us. Reef Divers takes the work out of your diving, handling the heavy lifting and care of your boat dive gear—from your first dive with us through your last dive (unless you’d prefer to do it yourself). We rinse, dry, and store your BCD and regulator daily, so they’re set up and ready for your next day’s diving. The only finger you’ll have to lift is the one to point out your gear as you relax in the boat, ready to go diving. At our dive shop, we have separate rinse tanks for photo equipment and wetsuits and general dive gear, plus hanging space for wetsuits so you don’t have to take them to your room. At Cobalt Coast Resort, we also have lockers where you can store your gear overnight. 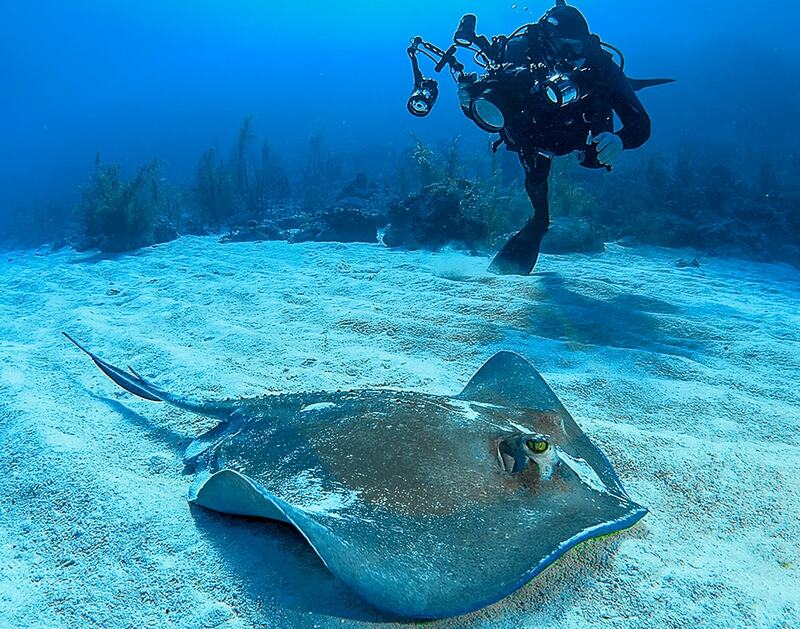 Cayman Islands diving is mostly current-free, which is optimal for new divers, divers who choose to move at their own pace, and underwater photographers who might want to spend their entire dive at one location, waiting for the perfect shot. All of our dive sites are moored, which marks the beginning and ending points of that dive. Our dive masters will brief the location, establish dive limits, and draw a map of the tour they’ll lead. As long as divers remain in buddy teams and stick with the predetermined limits, it’s their option to follow the tour or go off on their own. For those who follow, the tour lasts 35 to 40 minutes. By the time they’re back at the mooring, most divers feel comfortable enough to continue exploring on their own until their time is up or they run low on air. We recommend that divers who feel more comfortable following the tour remain on the boat and be among the last divers in the water. Reef Divers emphasizes safety first, followed by comfort. 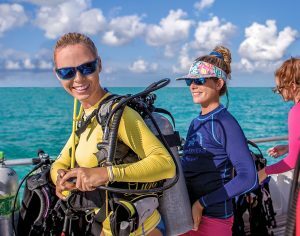 So, rather than having to perform an unbalanced “tank dance” to get from your seat to the rear of the boat with a 35-pound scuba tank on your back—we carry your gear for you and help you slip it on while you’re seated. Then it’s just one step into the Cayman Caribbean, where abundant marine life awaits your arrival. Established in 2012, Adventure Locators opened its doors as a Scuba and Dive Travel retail business. Over the years we have evolved into a well developed and respected business and where our customers stop by sometimes just to hang out and know that they are a part of our dive family. Being the only PADI & SSI Diamond Center in Mississippi, we offer SCUBA lessons from Beginner to the Professional Level as well as the only store in Mississippi to offer Freediving courses. We are the most equipped Scuba retail center in the Gulf Coast region, offering a full line of scuba manufactures from Aqualung, Atomic, Cressi, Mares, Seac just to name a few. If you are thinking about setting out on your own little adventure, let us help you with SCUBA travel destination. We offer rates for the individual as well as group rates. 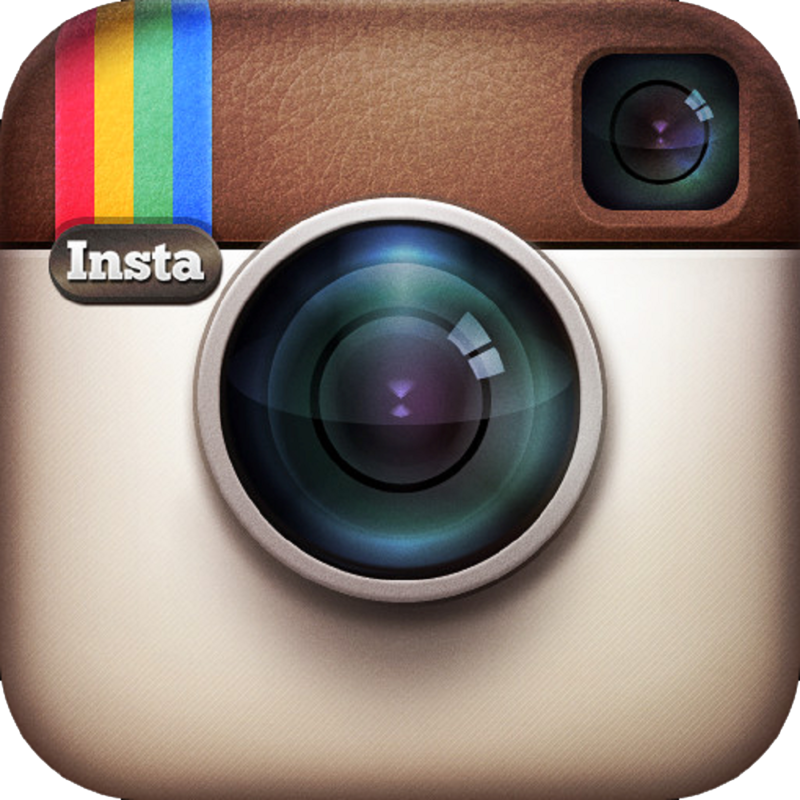 We are glad to help you with any questions or needs you may have – and remember to always “Live Life’s Adventure”! Be sure to stay Connected!